Inner Ear | Microanatomy Web Atlas | Gwen V. Childs, Ph.D. These exercises will focus on structures in the inner ear, particularly those involved with the sensory cells. There are several excellent overview diagrams in numerous texts. Consult one for an overview of the Ear canal and middle ear. Be able to understand how sound waves travel to the inner ear and how they are transformed. Trace the sound waves down the ear canal into the tympanic cavity. What is the function of the auditory ossicles, tympanic membrane, tensor tympani, and stapedius muscles? How are sound waves transformed into pressure on the fluid of the inner ear? In order to understand how the inner ear is organized, compare with figures in your texts that show how the membranous parts of the inner ear are embedded in the BONY LABYRINTH. Find the bony labyrinth. Most of the slide shows the snail like COCHLEA. Look at the cochlea with the lowest power. 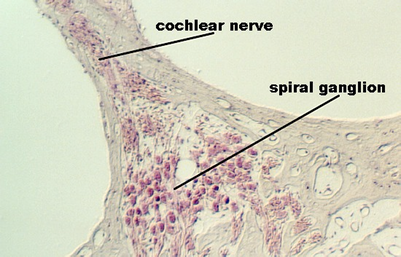 This photograph shows an overview of the cochlea. What fluid flows through the membranous labyrinth? What fluid flows through the bony labyrinth? The membranous labyrinth is divided into three chambers in a given section through one of the cochlear turns. These can be identified with the help from Figures in your text. Identify each of the chambers and the fluid in each chamber. Look at the contents of the Scala media. The ORGAN OF CORTI sits on the BASILAR MEMBRANE. 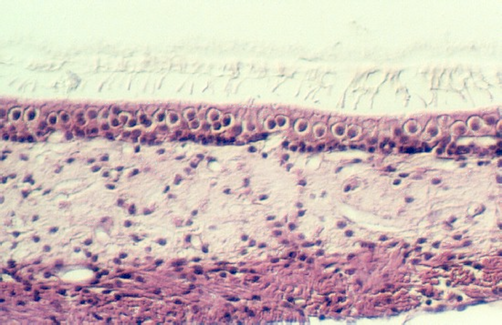 Find one in your class slide set that has a fairly intact neuroepithelium. Use the following photograph and figures or diagrams in your text to find some of these structures. 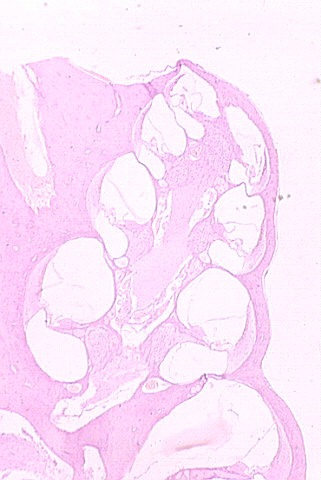 Identify as many parts of the organ of Corti in the above photo as you can. How do the hair cells get stimulated by the sound waves? What specializations are on their surface and what is the role of the tectorial membrane? 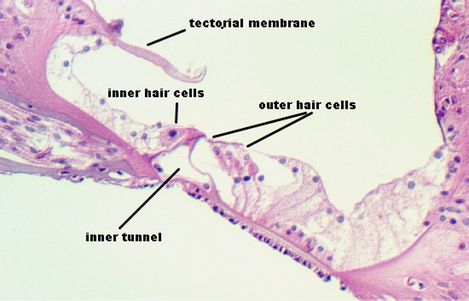 Look at the difference in supportive cells adjacent to the inner and outer hair cells. How could this arrangement aid in the contactile ability of the outer hair cells? 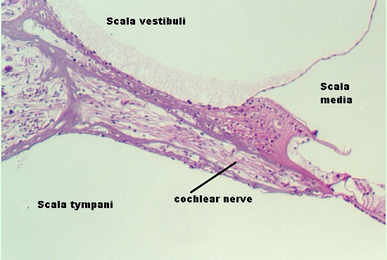 Along the wall of the cochlea, there is a band of stratified epithelium called the stria vascularis. It contains a plexus of capillaries which even extend up into the epithelium. 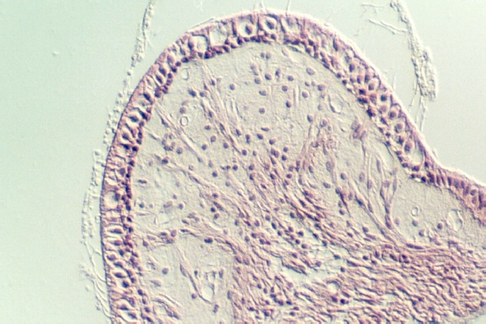 The following photograph shows a high magnification of the stria vascularis. 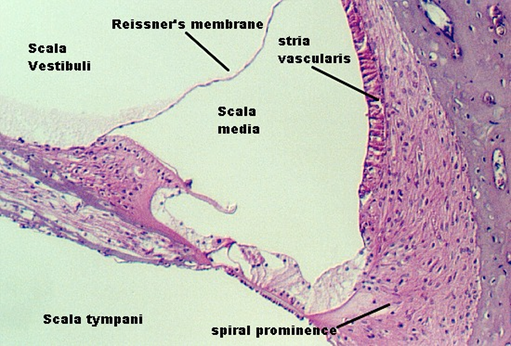 You can see Reissner's membrane at one end, dividing the scala media from the scala vestibuli. 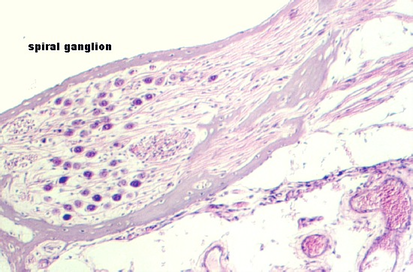 What is the function of the stria vascularis? 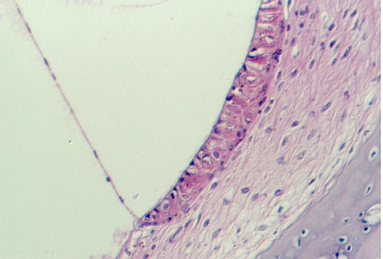 The following photograph of the organ of Corti show the cochlear nerve passing from the hair cells through the bone. It passes to the SPIRAL GANGLION CELLS which are seen well in most preparations. The spiral ganglion is seen in the following photographs. Review figures in your texts to gain an appreciation of the membranous labyrinth for this region of the inner ear. Your slides may have examples of neuroepithelial sensory structures in one or more of these regions. They may have been distorted, so you will have to rely on lecture notes and your text to orient yourself. 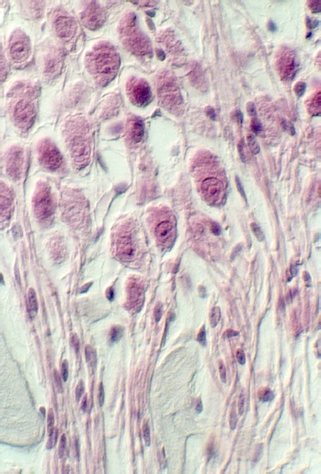 This photograph shows a view of the crista ampullaris. Higher magnifications are shown in the next photographs. Note: Even though the above figure is labeled afferent nerve fibers, one cannot distinguish these at the light microscopic level. 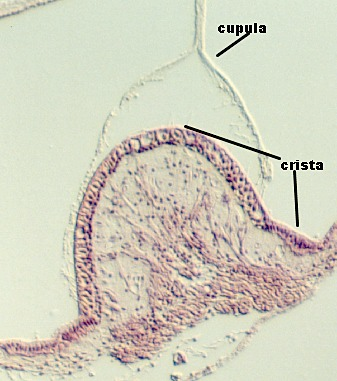 Find a crista ampullaris in your ear slides. Notice the position of the VESTIBULAR GANGLION (SCARPA's GANGLION) and its relationship with the cochlear division of Cranial Nerve VIII. What are the distinguishing features of a Type I and Type II hair cell at the electron microscopic level? 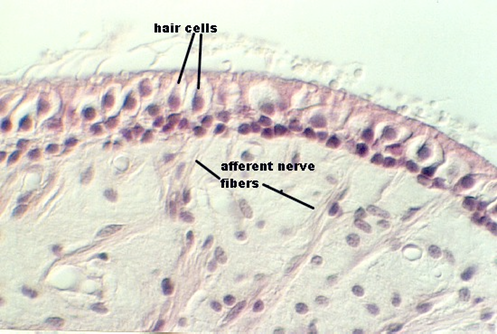 Which hair cells can be identified in these photos and why? 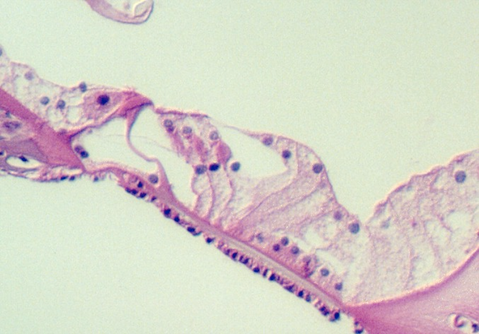 You may also be able to see an example of a macula from either the saccule or utricle in one of your ear slides. Use Figures in your text as a guide. The following photographs show different magnifications of a macula. You may be able to distinguish the SACCULE which is embedded in the bone, just adjacent to the cochlea. The relationship of the utricle within the inner ear has been distorted. 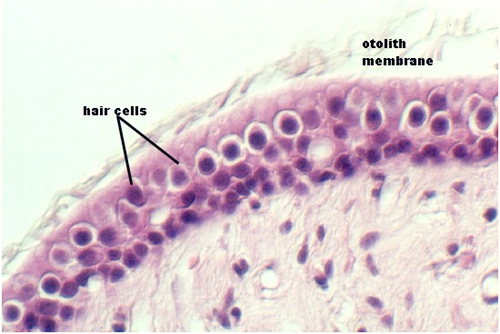 Identify HAIR CELLS and what is left of the OTOLITH MEMBRANE.